If you have ever had that instant connection with someone and just known that they are someone you have past life history with, this spread is for you. Chances are that you crossed paths again because there is a karmic bond between you and you were meant to meet up again. Karmic bonds are taken into consideration when souls plan for their next incarnation. Scenarios are created to help both parties resolve their karma, whether it be for recompense, retribution or simply to finally let someone go. I wrote an article about more types of personal karma and how to read on it with the Tarot last week. In Astrology, a karmic relationship where the other person has the ‘upper hand’ is shown by their Pluto aspecting one of your inner planets. Harsh aspects between their Saturn and your Sun (or vice versa) is usually a sign of tough karmic lessons. 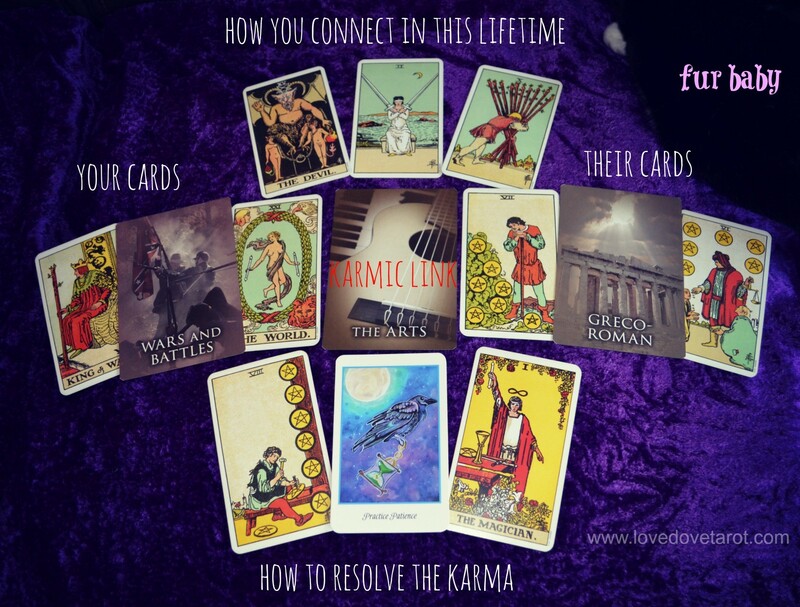 While Astrology is GREAT for showing us how people are linked karmically, I feel the Tarot has the upper hand when it comes to pointers about how to work this karma out… so let’s have a look at an in-depth Tarot spread I have created for that very reason. My preference is to work with mixed oracles for this spread but feel free to try it with only Tarot if that is all you have. I used three cards from Past Life Oracle because it is spookily accurate and one card from the Higher Intuitions Oracle – my favourite for positive transformation of any situation. The Tarot cards are from the Waite Smith Tarot deck. NB. This spread is only to be used when you are absolutely certain that you have a karmic bond with someone. Bear in mind that this is quite and advance way of reading the cards so don’t despair it is beyond your reach if you are a novice reader. Persevere and you will get there! Start by laying out the three Past Life Oracle cards. Study them carefully and make note of any intuitive thoughts and feelings that emerge. 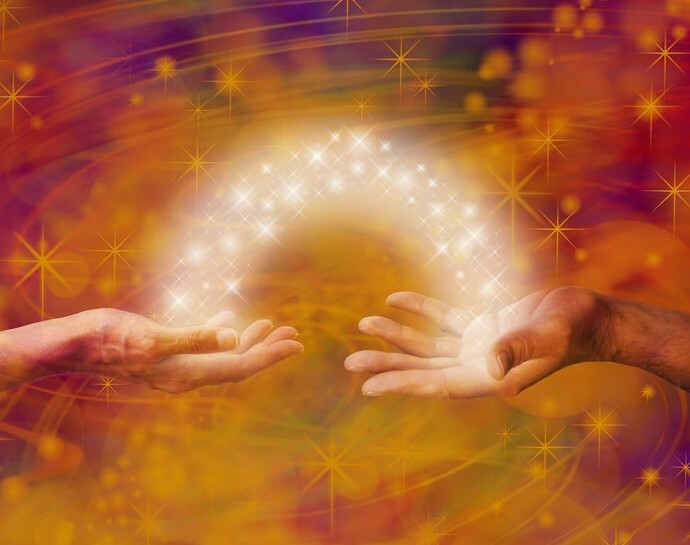 The Karmic link card tells you how you usually connect with the other soul and possibly why you have come together again in this life-time. Your Past Life Oracle card tells you something about your role in a key past life and theirs gives you insight into their role back then. Then lay the Tarot cards out beginning with the top three cards. This group of cards is to be read intuitively and tells you how you connect here and now as well as how things are likely to progress (read from right to left). The key is to allow the cards to tell you a story rather than trying to decipher individual card meanings. Feel the flow of energy in the Tarot cards. Here (The Devil followed by the 2 of Swords) we have a feeling of blocked sexual energy, for instance. This is a friendship but these two could have been lovers in a past life. Place one Tarot card on either side of your Past Life Oracle card and do the same for theirs. Now you have two groups of three cards each that tell a story of which portion of personal karma is being played out through this connection. In the sample reading above, you will note that the person (person number one) to the left was probably male and in a leadership position. S/he could be someone who hired the other person for artistic entertainment. S/he is also the one to most acutely be aware of a past life connection thanks to the presence of two of the karmic cards on their side of the spread. Finally, place the Higher Intuitions Oracle card below the central Past Life Karma card for advice on how to make the most of the dynamic you have in this life-time. Then place one tarot card either side of this card to see what you can learn from each other. The card on your side tells you what you can learn from them and the card on their side tells them what they can learn from you. Raven from the Higher Intuitions oracle brings a message of patience and there is a sense of things developing organically as the karmic pull is strong enough to unfold events without either party having to do much. It is interesting to note the sequence of numbers in the Pentacles for person number two, reflected in the 8 of Pentacles as the lesson person number one is meant to learn. You get a sense of person number one being better able to hone their skills and person number two developing leadership skills thanks to this connection. I recommend leaving the spread out for a while and coming back to it several times as things can gradually begin to make more sense. Also, don’t be afraid to ask for a bit of help from the Angels. Call on your own Guardian Angel and on that of the other person, as well as Archangel Jermiel who is the Angel of Past Life Reviews. If you have any questions about this spread, please feel free to ask in the comments below.